Thanks, everyone, for your concern about Casper. I’ve been following her around the yard every time she poops and haven’t seen zipper parts yet, though there was a lot of cargo short material for a couple of days! I’m still watching her closely but so far I think she’s “processing” everything herself. I wonder if Nicole‘s idea to use a metal detector in the yard would work on her belly? 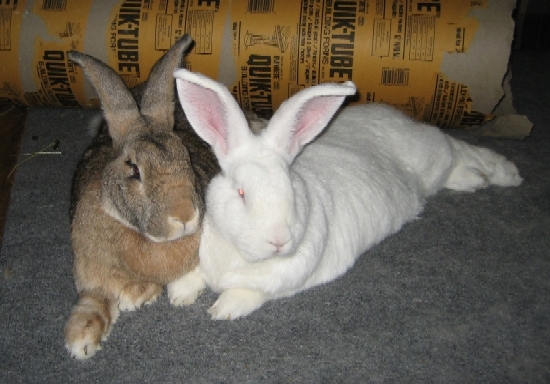 I took a picture of Dawn’s two Flemish Giants relaxing the other day. They are the biggest, sweetest rabbits ever. I too have a special fondness for Flemmies but do not have any right now, so I really love visiting Amelia and Nathaniel. Together they’re about thirty pounds of bunny love. I just LOVE this photo. i have a big Flemish giant boy ( Boris) and he looks lust like that when he is relaxed!! !